Chicago’s premier private yacht charters Book Now! When planning any event, there’s always the fear that what you envision will not become reality when the day comes to greet your guests. Thankfully, it doesn’t have to be that way. Instead of hoping for the best, why not guarantee that it is something special by planning your next event on a private yacht in beautiful Lake Michigan? Booking a yacht is a great way to take your event to the next level without adding stress to your life. At Anita Dee Yacht Charters, we make it easy to host the best event ever by recommending handpicked caterers, decorators, photographers, and entertainment. Whatever the reason for celebration, make sure you book your date early. There’s nothing worse than finding out too late that the date you wanted is already taken. When picking a date, keep in mind the weather and how long you’re going to be out on the water, as well as what time of day you want to embark. Anita Dee offers breakfast, lunch, and late-night cruises so that you’re not tied down to any specific kind of event. For example, breakfast times can be great for corporate events. If you’re looking for an evening or night out, however, you might want to plan around seeing the Chicago firework displays between Memorial Day and Labor Day. It’s always a big hit, and a show like that is sure to stay with your guests long after they step foot on dry land again. While the Chicago skyline seen from Lake Michigan is already quite the view, you’ll undoubtedly want to make sure that you set the perfect mood for your event through the decorations and floral displays you choose. If you’re looking for a florist for your event, all of Anita Dee’s preferred florists are beautifully creative, customer-oriented, and comfortable working on our vessels. Whatever you choose, you can rest assured that your event’s backdrop will already be beautiful. Don’t let a moment slip by! Hiring a photographer is crucial to making sure that your big day is remembered forever. While your guests snap selfies, let a professional capture the big moments – the things you won’t want to be behind a camera for. Anita Dee’s preferred photographers will keep your event alive through beautiful pictures and videos you’re guaranteed to love. As anyone knows, the best part of a party is the food. You’ll want to plan ahead to get the best caterer for your event. Of course, sometimes this can depend on what kind of event it is and what time of day it’s taking place. Is it a company breakfast meeting? A wedding rehearsal dinner? Maybe a Sweet 16, or even a prom? Anita Dee can accommodate up to 400 guests for an event on the water. Whatever the occasion, the right food can turn a good party into a great party. All of Anita Dee’s preferred caterers serve delicious, inventive meals without sacrificing customer service. And with full-service galleys on both of Anita Dee’s vessels, you already have the perfect setup. No party is complete without a little entertainment. Whether it’s a DJ or a band, you’ll want someone who’s able to get your guests on the dance floor. Anita Dee’s preferred entertainment companies can do exactly that. Our vessels also come with state-of-the-art sound systems, ensuring that your guests are entertained no matter where they are on the yacht. When planning your event, make sure not to skip over this crucial element. The importance of getting amazing music for your event just can’t be overstated. The most important thing to remember is that great people are the best part of any get-together. We know you want your event to be something that wows the people in your life, and we want the same thing. That’s why we offer completely private yachts, outstanding service, easy access to trustworthy Chicago companies, and even an on-board event coordinator to help you with all the details. Booking a private yacht for your event is easy, and your guests will talk about it for years to follow. For more information on Anita Dee Yacht Charters, feel free to contact us at (312) 379-3191, or send us a message online. An event is only as good as its venue, as event coordinators and veteran party throwers know all too well. You want to set your event apart from others while impressing your guests with a certain amount of class, luxury, and comfort. For many looking for new and exciting venues, chartering a yacht is the perfect solution as it provides stunning views, classy catering and cocktail options, and impressive amenities. There are countless reasons why you should choose a yacht for your next party, five of which are listed below. Impress your friends. Yacht parties are instantly high-class, so impress your friends and rent a yacht for your next party. Show off with catered hors d’oeuvres and tasteful cocktails as you sail Chicago waters and enjoy the company of up to 400 of your closest friends. Enjoy the Chicago skyline while sipping drinks on a yacht deck. The Chicago skyline is one of the most stunning in the country, and this view, paired with an evening of tasteful food, drinks, and music, makes for the perfect venue for any of your celebratory needs. Charter one of our yachts during a firework showing to make your event all the more spectacular. When split between friends, it’s an affordable change of venue for parties. Chartering a yacht may seem out of reach, but when split between friends it is an affordable alternative to other party venues. Your dream yacht excursion is within reach and only a phone call away. The Anita Dee II can hold up to 400 people, so it’s great for events. From weddings to high school reunions to anniversary celebrations, chartering a yacht will set your event apart from others of its kind and make a memorable experience for everyone involved. It’s a yacht—need we say more? Yachts have always represented a certain standard of luxury and pleasure, and having your event on a yacht will only enhance the experience of your guests and make your event the talk of the town. If you are looking for a venue that your guest will never forget, Anita Dee Yacht Charters has you covered. Our chartered yachts are specially designed to exude class, distinction, and luxury, and are perfect for practically any event. 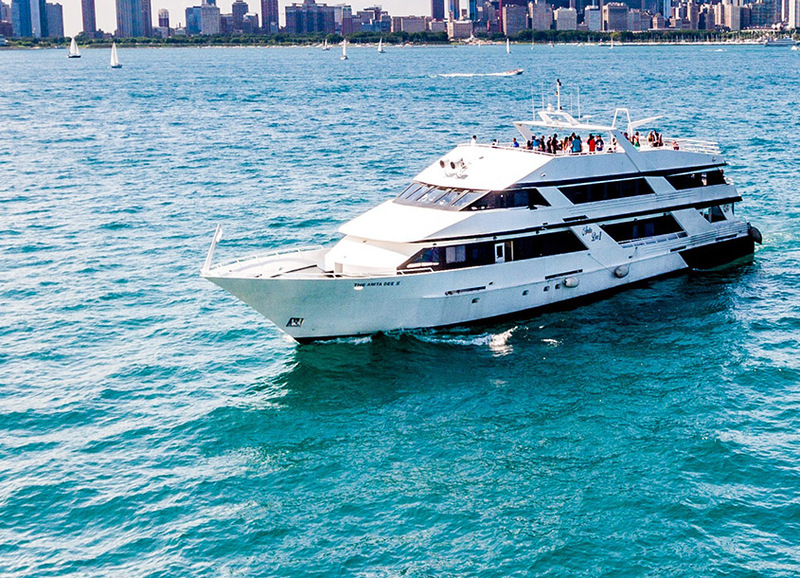 Make your event an experience that your guests will remember for years to come and enjoy a relaxing excursion on Chicago’s beautiful waters. For more information or to book your yacht today, please contact Anita Dee Yacht Charters at (312) 379-3191 today. Copyright 2017 Anita Dee Yacht Charters. All rights reserved.